The event is being put on by a couple of groups: MOI, AfroChic, and iheartmyhair.com. Before the Tresses N’ Dresses, six women will be cutting off their relaxed hair, on film and in front of their friends and family. Toronto Natural Hair and Beauty Show organizer Stephanie Walker will speak and there will be a book signing session by Dr. Nadine Wong, author of What If Your Hair Could Speak What Would it Say? and CEO of Alabaster Wellness Clinic in Toronto. 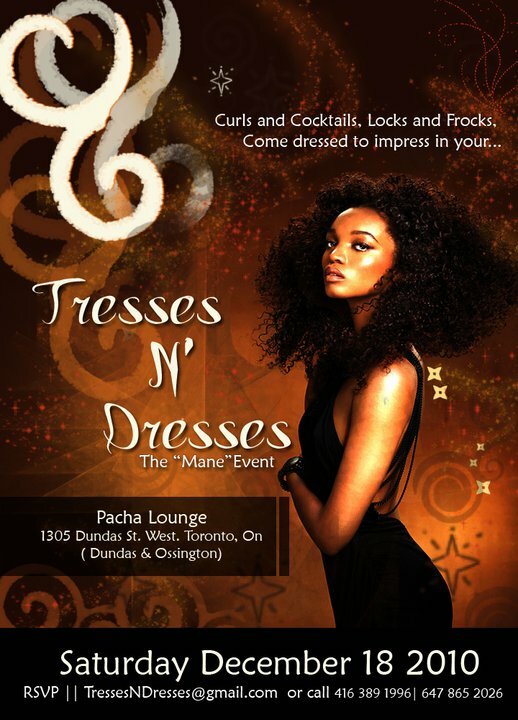 Tresses N’ Dresses is the after-party for the big chop event and a chance for naturalistas to celebrate their natural hair. Get ready to walk the red carpet and let the paparazzi snap photos of you in your best. Both events are happening on December 18 and you should dress to impress! Here are the details for the separate events. It doesn’t take a lot of persuading for me to want to dress up and whip my hair! So, depending what family/social events are happening that weekend, you may find me in at the event, cracking jokes, sipping something and chatting about hair. It does sound like fun! I’m hoping to go — it’s just that it’s so close to Christmas and my family is very social. We’ll see! I see Canada has it going on! Hi Beautiful… thank you so much for promoting this event. Just a few corrections. For the BIG CHOP event the location is at 3228 WESTON ROAD at Afro Girl Hair Design and attendees must RSVP to hairfo@iheartmyhair.com. Her is the video to assist with promo… THANK YOU SOOOO SOO SO MUCH kisses… have a blessed week.